The Monkey King’s tiger-pelt outfit and the Bull Demon King’s enormous nose ring have long been icons of these classic characters from Journey to the West <西遊記>. But in the upcoming 3D film adaptation, The Monkey King <西遊記之大鬧天宮>, directed by Cheang Pou Soi (鄭保瑞), the characters have taken on a more modern look. In a recent photoshoot for Harper’s Bazaar Movie, the cast showcases the movie’s unique blend of fashion and myth. This photoshoot marks the first time a film’s characters have appeared in costume in a fashion magazine. The Monkey King (Donnie Yen 甄子丹) is shown clad in exquisite body armor and grasping his golden cudgel, while the Bull Demon King (Aaron Kwok 郭富城) appears handsomely dressed in black with his iron staff perched on his shoulder. According to producer Liu Xiaoguang (劉曉光), The Monkey King underwent three years of fine-tuning in order to create the most ideal visualization of these mythological figures. Also featured in the photoshoot are Peter Ho (何潤東) as Erlang Shen, Xia Zitong (夏梓桐) as the Nine-tailed Vixen, Joe Chen (陳喬恩) as Princess Iron Fan, Zhang Zilin (張梓琳) as Nüwa, and Gigi Leung (梁詠琪) as Chang’e. However, the appearance of Jade Emperor, who is played by Chow Yun Fat (周潤發), has still not been revealed. 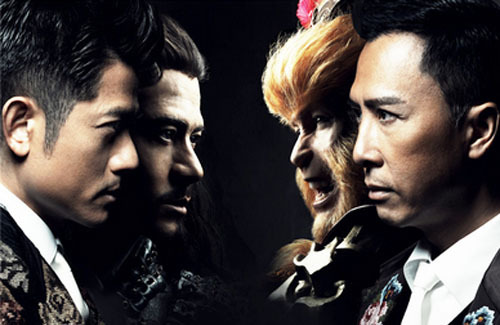 In order to create such striking characters, the producers of The Monkey King invited a Hollywood special effects team, as well as three well-known Chinese designers to join their group. William Chang (張叔平) is a film editor, production designer, and art director who has worked on all of Wong Kar Wai’s (王家衛) movies, Kenneth Yee (奚仲文) won a Hong Kong Film Award for Best Costume and Makeup Design for his work in Curse of the Golden Flower <滿城盡帶黃金甲>, and acclaimed costume designer Guo Pei (郭培) created the outfits for the 2008 Beijing Olympics Awards Ceremony. The Monkey King will open in theaters in early 2014. How many remakes have been made for The Monkey King? Will there be yet another remake in 5 years? Looks pro. But the CGI still looks crap. I think will wait for Iceman and Last Of The Best instead. OMG . can't wait .